2016 has been an exciting year for online marketeers, with the online shopping industry winning the hearts of many consumers. 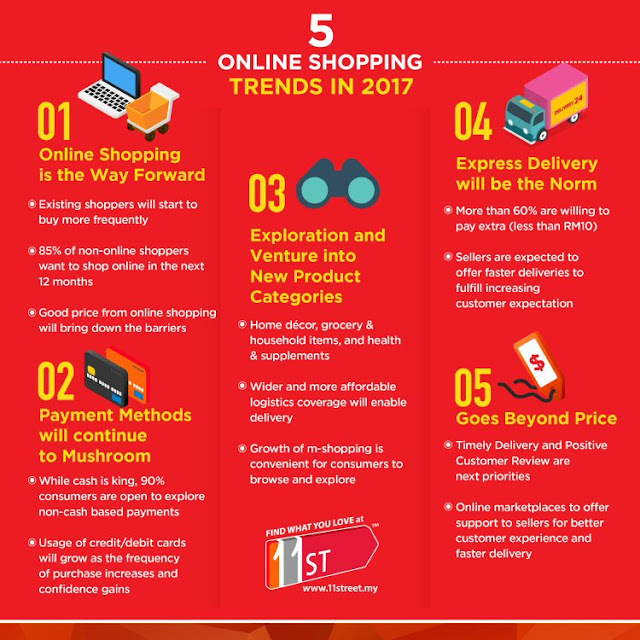 As the e-commerce sphere continues to thrive this serves as a great time to start thinking about how the industry is going to evolve in 2017. 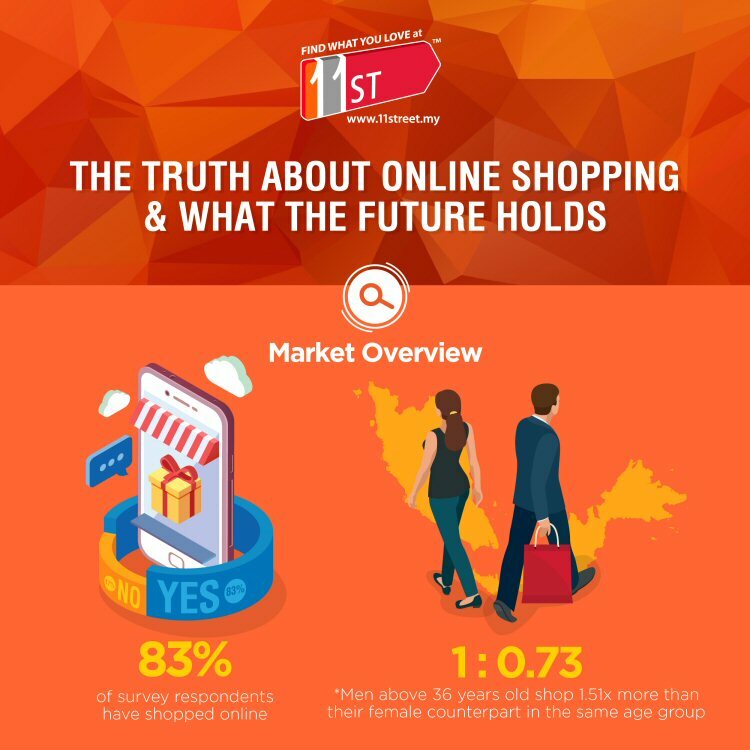 In a recent nationwide survey, 11street dived deep into the psyches of online shoppers to understand their sentiments with regard to e-commerce. Through this survey, 11street took the opportunity to set the tone for the e-commerce industry moving forward, and projected five key trends that will lead the way for online shoppers. These very trends also serve as a leverage for businesses to strategise their marketing plans, in order to adhere to what consumers want and how to go beyond expectations in terms of customer service and product delivery. You can also view full infographic here. Constant connectivity to the Internet and a multi-screen world are changing the way consumers see online shopping. The distinction between digital and in-store journey is blurred, and so spurs brick-and-mortar retailers to consider integrating e-commerce and m-commerce into their existing business plan. While consumers are not 100% abandoning physical stores anytime soon, it is predicted that existing online shoppers will continue to buy more frequently, and non-online shoppers would start to explore e-commerce in the next 12 months. This is based on the results of the survey, in which 85% of respondents who have never shopped online before expressing interest in hopping aboard the online shopping bandwagon in the next 12 months. 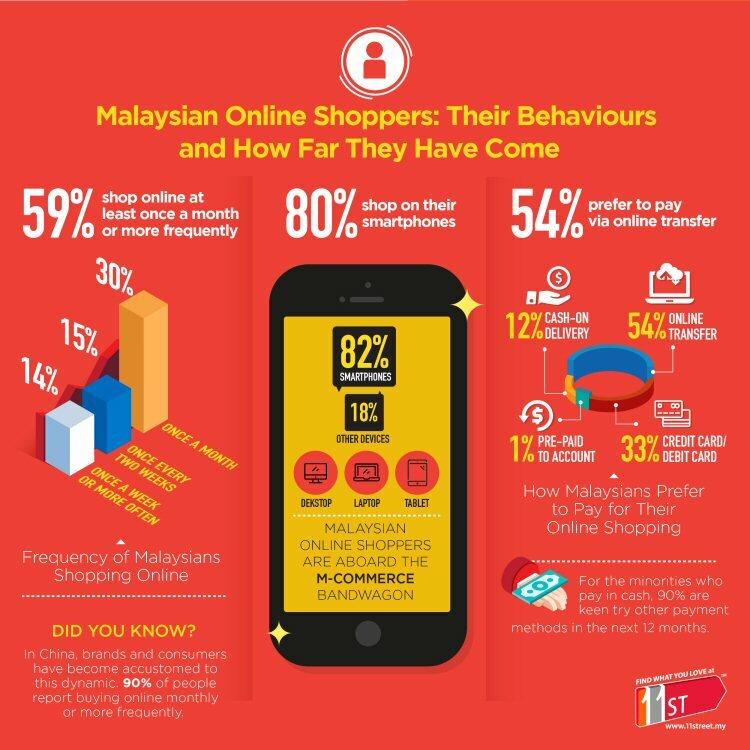 This spark of interest is likely encouraged by the satisfaction of existing online shoppers, as well as the competitive prices non-online shopping consumers may find online. 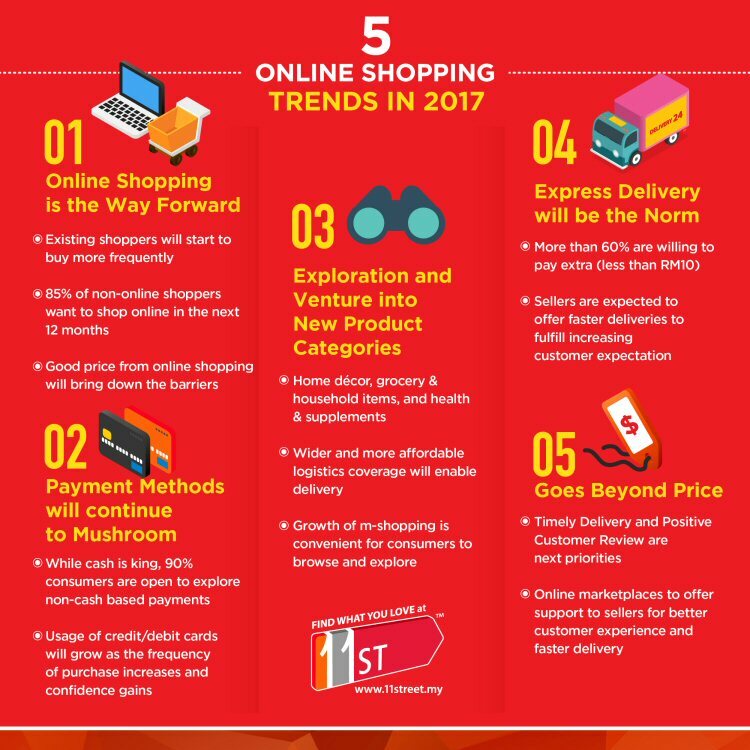 With this revelation, the barrier between online and non-online shoppers will be further brought down, thus cementing online shopping as the way forward for consumers come 2017. While cash is king, 90% consumers who responded to the survey are now more open to the idea of opting for non-cash payment methods than they never had before. This means that businesses must up their game and offer multiple payment options, in a move to increase sales through the improvement of customer convenience. With more non-cash payment methods such as credit card and debit cards, and online bank transfer, businesses must take the necessary measures to ensure that these transactions are secure, so that consumers continue to gain confidence in their online payments. This is a win-win situation for every party in the industry. Firstly, businesses with an online arm will continue to thrive when they offer more payment options for their customers. Secondly, consumers who are exposed to a myriad of payment methods get the option to choose their preferred channel, and in the long run, better manage their finances. Thirdly, online marketplaces will impose a more stringent payment monitoring system, resulting in safe online transaction for all. Just like every other industry - big or small - the emerging e-commerce capabilities are pushing for changes in trends. If you were to buy furniture or fresh produce online two years ago, you would think: "Furniture products such as sofas, or fresh produce such as poultry and vegetables, are the kind of things people will never buy online simply because most will want to have a touch and feel of the items. Not only that, how will it even be delivered?" Well, this is 2017 and that scepticism is about to change. 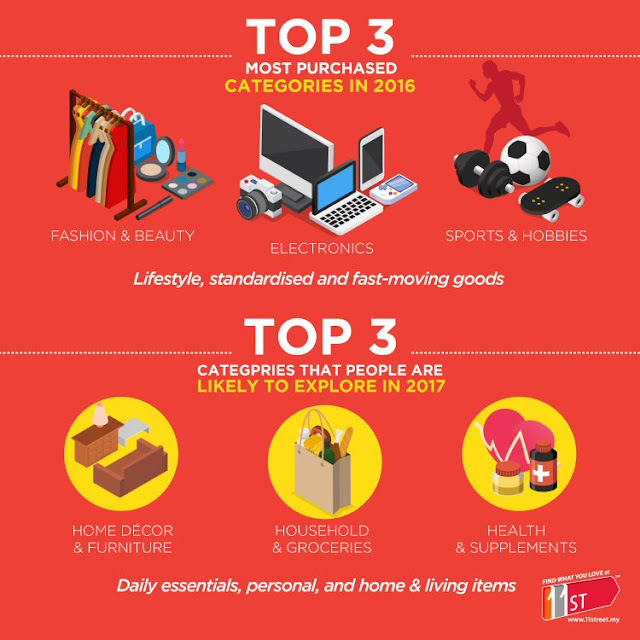 Survey respondents have revealed home décor and furniture, household and groceries, and health and supplements as top priority categories that they will likely to explore in 2017. As consumers gain familiarity with online shopping and with increased logistics coverage and affordability, it is envisioned that consumers will begin shopping for daily essentials, fresh produce and personal items online, thanks to the easy accessibility of shopping apps that enable the easy browsing and purchasing right off their smartphones. As the logistics industry grows exponentially to keep up with the rigorous demands of online shopping, it is predicted that consumers will relook the timeline as to when they would like their purchases to be delivered - in this case, the faster the better. 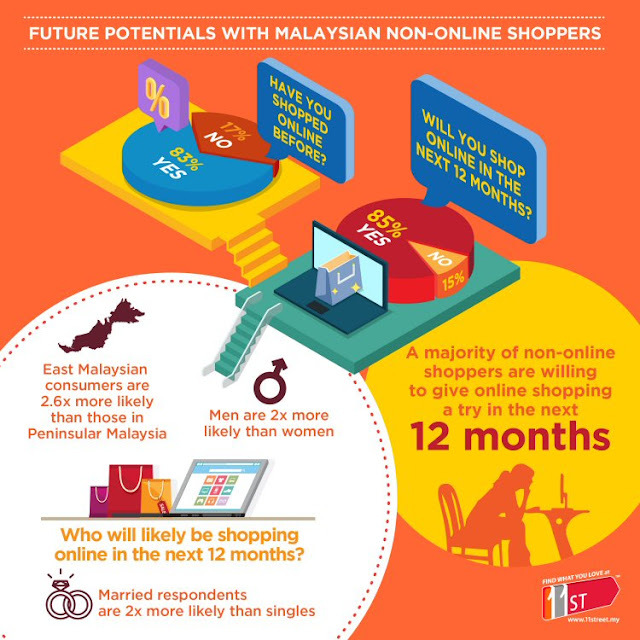 While 90 of the survey respondents indicated that they would be willing to wait up to one week for the delivery of their purchases, more than 60% of them stated that they are willing to pay extra up to RM10 for express delivery. 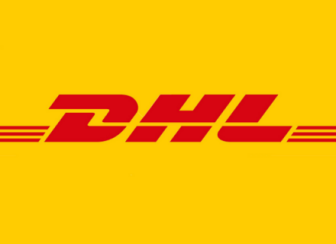 As a setting trend for express delivery moving forward, in which consumers expect faster delivery at more affordable price, established couriers should take note of these advances and adapt their services to keep up with technological advances in order to continue keeping the customers happy by offering better services and faster delivery. At the end of the day, while we have established that consumers are encouraged to shop online due to its many cost-saving benefits, it also boils down to all the other frills such as customer service, positive product reviews, and many more. Therefore moving forward, sellers will have to step up their game and go the extra mile to deliver better services by familiarising themselves with the processes of managing growing sales volume, rising expectations on logistics, and delivering impeccable customer service. The e-commerce industry goes beyond a mere shopping experience - it is a shopping revolution.